YOU’RE COMING FROM THE SOUTH ? 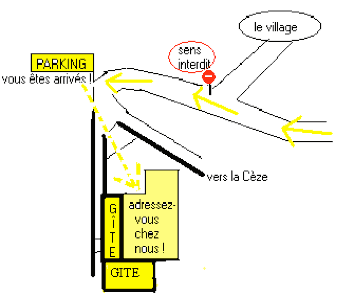 Here is your simplest route: (“autoroute: sortie Nîmes Ouest”) motorway, Nîmes Ouest exit, to Alès. Reaching Alès, turn right onto the byroad (“rocade” in French); go to the roundabout that signs SALINDRES on the right ( road number D16); then look for BARJAC. Drive to ROCHEGUDE. After ROCHEGUDE, leave the Pont de Tharaux on your left and follow the uphill road towards MEJANNES LE CLAP. A crossroad; some 20 metres beyond that crossroad turn left to THARAUX. Keep driving over 1 kilometre or so. Guide yourselves according the When entering THARAUX paragraph down the page. YOU’RE COMING FROM THE NORTH ? A9 motorway; exit BOLLENE, PONT-SAINT-ESPRIT; drive to BARJAC. Go further on to ST JEAN DE MARUEJOLS. Leaving ST JEAN DE MARUEJOLS turn left to MEJEANNES LE CLAP. 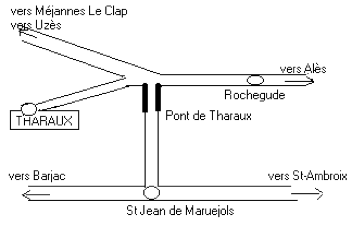 Drive across the Pont de Tharaux – a one lane suspended bridge; you come to a cross-road; immediately after the cross-road, turn left onto THARAUX. Keep driving over 1 kilometre or so. do drive into the no-entry road ! Ignore the uphill road on your right! The “Gîtes de France” road-signs should help. Drive on 200 metres. You then reach a parking area. Park there. Our house is situated just where the road separates into two paths. Be careful not to go downwards, it’s a cul-de-sac, you’d end up at the river! that’s our name; everyone knows everyone else at Tharaux!